본 연구는 시간과 공간제약이 많은 학교 현실을 고려하여 일회적으로, 학교폭력 가해경험과 피해경험이 많은 중학생 대상을 학급 단위로 진행하여, 다양한 입장과 상황을 이해하고 문제해결의 경험을 할 수 있는 역할극을 활용한 학교폭력 예방 교육 프로그램을 개발을 하고자 하였다. 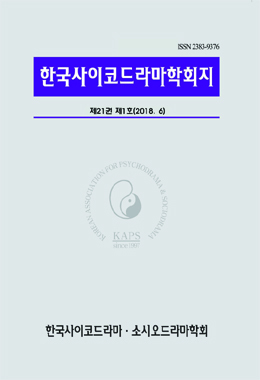 이를 위하여 문헌연구와 내용분석 및 전문가 자문을 받았고, 2008년 7월부터 10월까지 U시의 중학교 5개교 1,433명을 대상으로 예비 프로그램을 실시하여, 참여자의 학교폭력 예방교육 참여 만족도와 학교폭력 예방교육 서술형 결과분석을 하였다. 이러한 결과를 통하여 F.R.Shaftel and G.Shaftel(1982)이 제시한 역할극 수업모형을 바탕으로 하여 프로그램이 구성되었다. 도입과정으로 ① 프로그램 소개, 준비과정으로 ② 촉진활동과 ③ 역할극 상황설정과 준비단계로 이루어지고, 전개과정으로는 ④ 역할극 참가자 선정 ⑤ 관객의 준비자세 확인 ⑥ 역할극 시연 ⑦ 역할극에 대한 토론 및 평가 ⑧ 수정된 역할극 시연단계가 이루어진다. 끝으로 마무리 과정에서는 경험의 공유와 일반화 단계로 이루어진다. 본 프로그램은 일상에서 일어날 수 있는 다양한 상황을 참여자들이 선택할 수 있도록 하였다. 역할극 실연과 토론을 통한 참여로 등장인물 뿐만 아니라 관객이 적극적으로 프로그램에 참여할 수 있도록 하였다. 그리고 반 전체의 집단응집력을 향상시킬 수 있는 촉진활동을 준비하도록 하였다. This thesis is to develop the school violence prevention program for the middle school students who have experiences of offender and victim in school violence through role play in which they can afford to understand various positions and to have an experience of solving the violence problems. The process of this study is carried out by the classes and one-time performance, considering the situation of school with a lot of restrictions of time and space. To do so, bibliographical study and analysis of the research materials are carried out, and also the professionals` advice is received. The study object is 1433 middle school students of 5 Middle Schools in U city. For them, the preparatory program is carried out from July 2008 to October 2008. And then, the analysis for the satisfaction degree of participation in the program and for the descriptive results of the school violence prevention education is carried out. Under the research above, the program of this study is made out on the basis of role-playing study model presented by F.R.Shaftel and G.Shaftel(1982). The courses of the program are as follows. The Introduction Course includes an introduction of the program. The Preparatory Course includes a facilitative activity, a situation setting of role play and its preparatory step. The Developing Course includes a selection of participants in role play, checking the audience`s readiness for the performance, a performance of the role play, a discussion and evaluation on the role play, and a performance steps of the revised role play. The final Concluding Course includes a step of sharing the experience and its generalization. In this program of this study, the participants are able to choose the various situations which may happen in their ordinary lives. This program gives a chance for the characters in stage and also the audience to participate in the program actively by the performance and discussion between the characters and the audience. And the facilitative activity which is able to heighten the coercive strength of the whole class is prepared.